Navigate to Mount Zhayolm, via either the Halvung Staging Point or by going thru Halvung and head west. At (J-7), pass thru the Gates of Halvung and continue heading west. The spawn location is at (I-8). In Greek mythology, Cerberus was a three-headed monster dog that had a snake for a tail. Some accounts give Cerberus 50 or 100 heads. Cerberus guarded the gates at the entrance of the Underworld for Hades, Lord of the Underworld. Cerberus was positioned on the far side of the River Acheron (river of woe), the river Charon would ferry the dead across for the fee of 1 obolus. Cerberus role was to keep the dead in the underworld and the living out of the underworld. 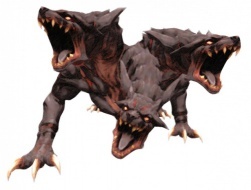 Thus, Cerberus can be considered the first depiction of a “hell-hound”. Hercules’ 12th (and final) labor was to capture Cerberus. Hercules was able to wrestle Cerberus and capture it. While Cerberus was considered an imposing guard dog that remained ever vigilant and let no one pass who shouldn’t, Orpheus used music to make Cerberus fall asleep, Hermes used water from the River Lethe to also make Cerberus fall asleep, and Psyche made Cerberus fall asleep using spiked honeycakes. Cerberus was the offspring of the monsters Typhon and Echidna. Its siblings were Chimera, Orthrus, Hydra, Ladon, Ethon, the Nemean Lion, and the Sphinx. Cerberus is the English rendering of the Greek Kerberos which means “demon of the pit”. This page was last edited on 10 October 2017, at 22:30.